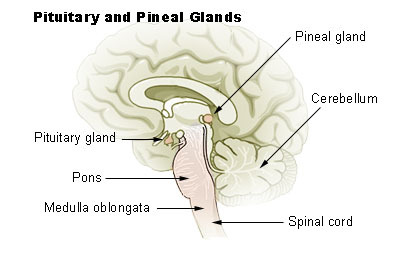 Calcification of the pineal gland is typical (1% of study participants) in young adults, and has been observed in children as young as two years of age. The calcified gland is often seen in skull X-Rays. Calcification rates vary widely by country and correlate with an increase in age, with calcification occurring in an estimated 40% of Americans by their 17th year. Calcification of the pineal gland is largely associated with corpora arenacea also known as “brain sand”. Some studies show that the degree of pineal gland calcification is significantly higher in patients with Alzheimer’s disease vs. other types of dementia. Pineal gland calcification may also contribute to the pathogenesis of Alzheimer’s disease and may reflect an absence of crystallization inhibitors. Calcium, phosphorus, and fluoride deposits in the pineal gland have been correlated with aging, showing that, as the brain ages, more deposits collect.